Hello and welcome to the 161st installment of the SWD. Head of the Aleppo’s branch of the ‘Syrian Resistance for Liberation of Liwa Iskenderun’, Jamal Trablosi was wounded in an assassination attempt, which targeted his vehicle with an explosion, near the Cultural Center in Al-Aziziyah neighborhood of Aleppo. Islamic State put up heavy resistance in the city of Raqqa today, not allowing SDF to make significant progress. Just near the “Russian buildings”, in the southwestern Raqqa, 10 SDF‘s fighters were reportedly killed by IS’ improvised explosive devices. IS’ SVBIED targeted SDF near Raqqa’s “Savings Housing”, while IS’ snipers killed five SDF‘s fighters and injured two others, in several areas of Raqqa, according to Amaq. Yesterday’s clashes in Abu al-Hayes street in the eastern part of Raqqa, allegedly resulted in death of six SDF‘s fighters. Islamic State launched a raid against the Syrian Arab Army near Al-Sabkhawi well, which was captured by the latter yesterday. The raid killed six SAA‘s soldiers, according to Amaq Agency’s statement. Hayat Tahrir al-Sham reportedly imposed full control over the city of Idlib, after Ahrar al-Sham’s elements withdrew from their positions. Shortly after that, an ammunition vehicle exploded near Al-Ziraea roundabout, causing at least four deaths. Ahrar al-Sham’s fighters evacuated their positions at the Bab al-Hawa border crossing with Turkey, as a part of the deal with Hayat Tahrir al-Sham to hand over the crossing to the civil administration. Ahrar al-Sham’s convoy consisted of more than 20 vehicles and was headed towards Al-Ghab plain. 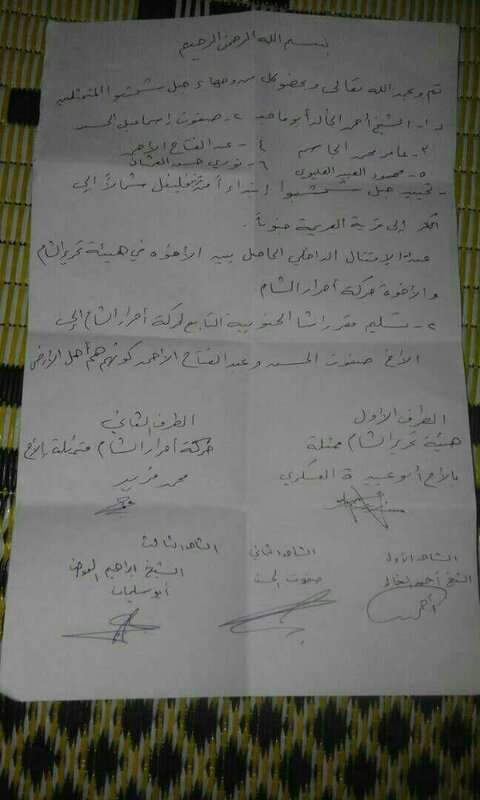 Hayat Tahrir al-Sham declared it handed over Ahrar al-Sham’s HQs in Jabal Shashabo area, to the locals. Ahrar al-Sham’s sniper wounded a civilian in Binnish, violating the agreed upon truce. Amaq Agency reported IS’ fighters ambushed Syrian Arab Army in the village of Dakila, east of Al-Salamiyah. According to the Amaq’s statement, 10 SAA‘s soldiers were killed and three captured. Reports suggest that Syrian Arab Army and allies advanced against the Islamic State in the desertous area, east of Al-Hail gas field. Islamic State reportedly destroyed SAA‘s tank on Jabal Tafha in the eastern Homs governorate. Syrian Arab Army and the Air Force violated the ceasefire agreed upon yesterday between the Syrian Armed Forces and Jaysh al-Islam. Air Force conducted two airstrikes over Al-Rayhan and Douma, SAA‘s artillery also shelled the latter locality. Since Faylaq al-Rahman isn’t a part of the agreed ceasefire, operations continue without objections on Ain Terma front. SyAAF carried out six air raids and the Army launched at least 10 ‘elephant missiles’. Hayat Tahrir al-Sham reportedly damaged SAA‘s BMP on Arbeen front. Two members of Ahfad al-Rasul group, part of the Free Syrian Army, were killed by an improvised explosive device on the road between Daraa and Gharz. Rebel “Daraa Martyrs Documentation Office” confirmed these casualties, identifying the killed fighters as Mowaffaq Mohammed Al-Mahameed, and Mousa Faisal Al-Mahameed. Yesterday, Islamic State reportedly assassinated an officer and two Iraqi soldiers in Al-Zaidan area, southwest of Baghdad. Iraqi Army’s 17th Infantry Division conducted “inspection” operations in Al-Fahil and Al-Obeid areas, south of Baghdad. During the operations, Iraqi forces found four missiles and an improvised explosive device in four buildings. Several individuals were also arrested. On the 22nd of July 2017 CJTF-OIR has conducted 10 strikes in Syria. CJTF-OIR‘s main focus in Syria at the moment is Raqqa region where they did nine strikes supporting SDF‘s operations against IS destroying eight fighting positions and a mortar system, and damaging two supply routes. Other area where one airstrike occurred is Abu Kamal (Al-Bukamal) and Deir al-Zour, destroying 12 IS oil storage tanks. Full report on CJTF-OIR strikes conducted in both Syria & Iraq can be found here. Islamic State’s Amaq Agency reported death of six Filipino soldiers due to clashes in Lilloud Dagoduban district of Marawi. Yesterday, Philippine Army’s armored vehicle was destroyed by IS’ fighters with an RPG in Marawi.